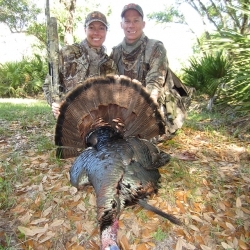 "This was Beth’s first Osceola and we will never forget our hunt with Jeff. 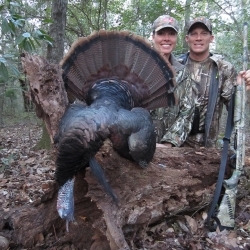 He is not only a great guy, but a great hunter and we look forward to our next trip with him in the woods." "I've successfully hunted with Jeff for 15 years for WhiteTail, Mule Deer, Elk and of course a Grand Slam. He never ceases to amaze me with his energy and professionalism! He is not just a guide, but has become a good friend as well." "I've known Jeff for the last 6 years and he never ceases to amaze me. I traveled with him to harvest my first Single Season Grand Slam and it’s an experience of a lifetime." "I hunted 3 states in 5days with Jeff, killed 5 turkeys, and blew at least 3 times that number of shots on birds at 20 yards or less. (I'd lie about this except that there were witnesses.) 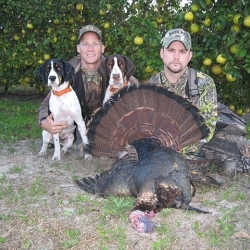 'Obsessed' doesn’t really do justice to Jeff's desire and ability to put a client on turkeys. He’s one of those guys tuned into a turkey frequency unavailable to the rest of us. 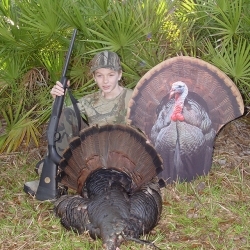 If he hears a gobble, finds a track, or sees a feather, he will put you on that bird. I almost came to feel sorry for the turkeys we encountered. They weren’t getting past Jeff. Their only hope was to have me behind the trigger." 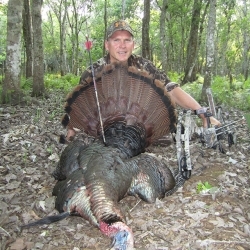 "I've guided and booked countless hunts, so I know what it takes to get the job done. 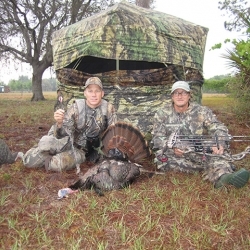 I hunted Osceolas with Jeff for several years and he always hit it out of the park!" Whether you are an avid hunter or you've never chased a Turkey before, you will never forget a Spring in the woods with Jeff. With thousands of acres of private land to hunt on, we will help you find the gator (and the adventure) you're looking for.